Background and Objective: Transmucosal analgesic delivery is a promising approach to periodontal postoperative pain management. The purpose of this clinical trial is to appraise the effectiveness of transmucosal drug delivery system with meloxicam films and to identify its minimum effective dosage via this route after periodontal flap surgery. Materials and Methods: The analgesic mucoadhesive films were formulated using meloxicam and hydroxypropyl methyl cellulose polymer by solvent casting method. The sample size consisted of 60 chronic periodontitis patients who require periodontal flap surgery. The subjects were randomized using lottery method into four groups (Group A - 45 mg; B - 30 mg; C - 20 mg; D - 10 mg meloxicam per film). After periodontal flap surgery, the respective meloxicam mucoadhesive films were placed over the surgical site and were removed on 4 th day of postsurgery. The primary outcome measure was postsurgical pain level and recorded at 1 st , 2 nd , 3 rd , 4 th , 5 th , 24 th , and 48 th h using a 0-10 mm visual analog scale with markings from 0 = no pain to 10 = extreme pain. Results: The postoperative pain control observed in Groups A and B was found to be effective, and the patient comfort level was very satisfactory. Whereas in Group C, it was found to be high in the first 3 h postsurgically, after which adequate pain relief was seen. Group D exhibited inadequate pain relief. No adverse reactions were noted after applying the film in any of the groups. Conclusion: Transmucosal delivery of meloxicam was found to be effective and safe in postsurgical pain control of periodontal flap surgery. The minimum effective dosage via this route for meloxicam was found to be with 30 mg mucoadhesive films. Nonetheless, the application of meloxicam mucoadhesive films in transmucosal drug delivery for periodontal postsurgical pain control has not been established to the best of the author's knowledge. Henceforth, the objective of this study is to appraise the effectiveness of meloxicam mucoadhesive films for postsurgical pain control and to determine its minimal effective dosage in transmucosal drug delivery route after periodontal flap surgery. This study was a prospective, double-blinded, simple randomized, parallel group assignment, phase 4 clinical drug trial that took place from April 2013 to February 2014. The study protocol was approved by The Institutional Review Board, Bapuji Dental College and Hospital and conducted in accordance with the Helsinki Declaration of 1972, as revised in 2000. The required mucoadhesive films were prepared at Bapuji Pharmacy College. The subjects for the study were from the outpatient Department of Periodontics, Bapuji Dental College and Hospital. For the trial, the Type 1 error (α) was fixed at 5% and that of the Type 2 error (β) at 20%. Thus, the power of the study was 80%. The data required for calculating the sample size were obtained from the published scientific literature. The maximum mean value of the four groups was taken as 2.54, the minimum mean value as 1.39, mean difference as 1.15, and the pooled standard deviation as 0.83. The required sample size per group was calculated as 13, which was then rounded off to 15. After obtaining informed written consent, 60 patients (28 males, 32 females aged 30-65 years) were enrolled in the study [Table 1]. Patients with periodontal pocket depth of 5-8 mm and with radiographic evidence of bone loss requiring flap surgery. Patients who had known or suspected allergy to meloxicam, pregnant and lactating women, history of using analgesics or other agents that may interfere with the analgesic response with meloxicam films and those who were refusing to give written informed consent, patients not able to understand the purposes of the study or not willing to return for the control visits, with major psychiatric disorders that, in the investigator's opinion, could compromise study participation, patients enrolled in any other clinical trial in the previous 3 months and employees of the study center with direct involvement in the proposed study or other studies under the direction of the main investigator or study center, as well as family members of the employees or investigator were excluded from the trial. 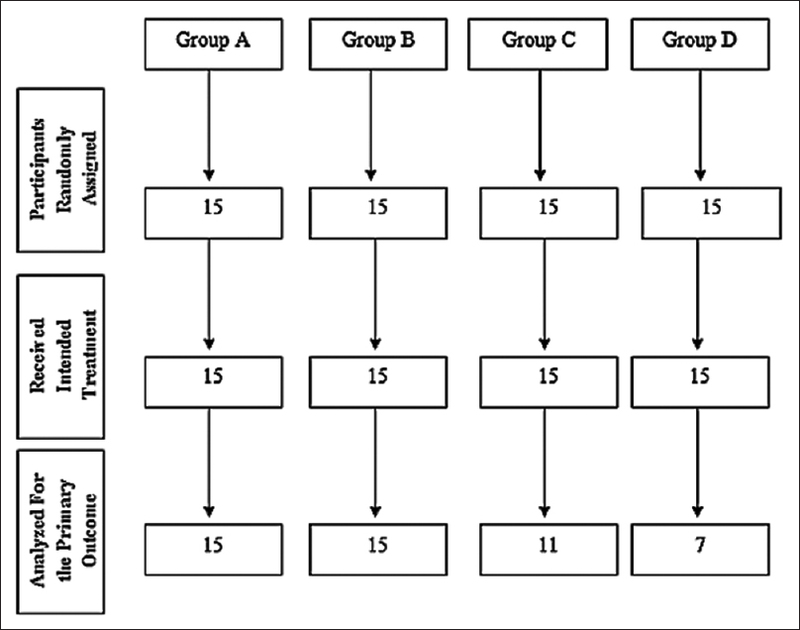 The subjects were divided into four groups by simple randomization using lottery method, with 15 patients in each group as follows: Group A (45 mg meloxicam containing film), B (30 mg meloxicam containing film), C (20 mg meloxicam containing film), and D (10 mg meloxicam containing film). The random allocation sequence was generated by the research assistant Dr. Kanchan Arya, who allocated the respective films for the subjects in each group. The investigator and the subjects were not aware of the specified allocations in each group. Mucoadhesive patches of meloxicam were prepared using solvent casting technique. Hydroxypropyl methyl cellulose (HPMC) polymer (350 mg) was weighed accurately and dissolved in 5 ml of ethanol. The beaker-containing polymer and ethanol was kept aside for 5 min for swelling of polymer. Meloxicam (180 mg) was accurately weighed and dissolved in 5 ml of ethanol. Further, 3 ml of ethanol was added to the above-mentioned polymer solution and the dispersion was stirred. Then four drops of dibutyl phthalate was added to the polymer solution as a plasticizer. The drug solution was added to the polymer solution and was mixed thoroughly with the help of a magnetic stirrer. The mixture was set aside until all air bubbles escaped. Prefabricated glass mold of size 5 cm × 3 cm was placed over a flat surface, which was verified using mercury level. The whole solution was poured into the glass mold. The inverted funnel was placed over the mold to avoid sudden evaporation. The mold containing polymeric solution of drug was kept for 24 h at room temperature for drying. After drying, the patch was removed from the mold, covered with wax paper, and preserved in desiccators until further use. The prepared patch was then cut into 1, 2, 3, and 4.5 cm 2 films which contained 10, 20, 30, and 45 mg meloxicam, respectively. All the above-mentioned steps were conducted in a sterile environment. The prepared films were used to treat the patients after their evaluation in Bapuji Pharmacy College. In all the subjects, periodontal flap surgery was performed under local anesthesia. After suturing, the preformed meloxicam-containing films were placed on the attached gingiva, over which periodontal pack was placed. The mucoadhesive films were found to be easily foldable and had enough plasticity to be properly adapted to the gingival morphology, thus making the placement of the film easy. Care was taken in proper positioning of the film for optimal drug delivery. Then routine postoperative instructions were given. The primary outcome measure was postsurgical pain level and recorded using 1-10 mm visual analog scale (VAS) at 1 st , 2 nd , 3 rd , 4 th , 5 th , 24 th , and 48 th h postoperatively in each group. Immediately after the placement of the film, manifestations of any allergic reaction (irritation, itching sensation) were observed for first 1 h postsurgery, subsequent to which patients were discharged. No further oral analgesics and antibiotics were given as a part of research protocol. Only in the patients who had pain scale of more than 5 for 2 consecutive h, the oral analgesic tablet (diclofenac - 50 mg, TDS) was given on a 'need to treat' basis. All the analgesic films were removed at 4 th day of postsurgery. None of the patients reported any allergic reactions after the application of the analgesic film. Healing was found to be satisfactory in all the experimental sites, without any complications. Group C 4 patients and Group D 8 patients had sustained increased pain level, hence on the "need to treat" basis, were given oral analgesics and not included in the statistical analysis [Figure 1]. The level of significance was taken as α =0.05 and * denotes significant difference. The recorded VAS measurements were statistically analyzed using Kruskal-Wallis test. If significant difference was noted, then multiple comparisons using Mann-Whitney test was carried out. Comparison of the change in VAS between different time intervals in all the groups was done using Wilcoxon Signed Ranks test. 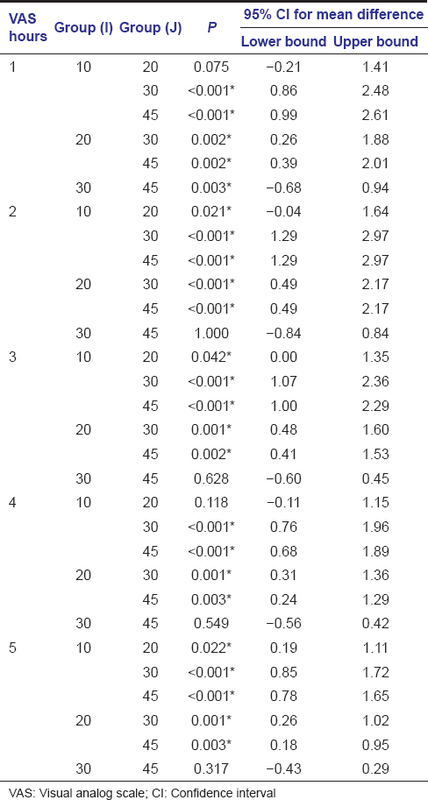 The mean pain levels obtained with the standard deviation is by Kruskal-Wallis test and is tabulated [Table 2] and Graph 1]. In the VAS at 24 and 48 h, the P > 0.05, thus Mann-Whitney test was not conducted further. However in the 1, 2, 3, 4, and 5 h, the pain levels were found to be statistically significant and thus multiple comparison was carried on [Table 3]. 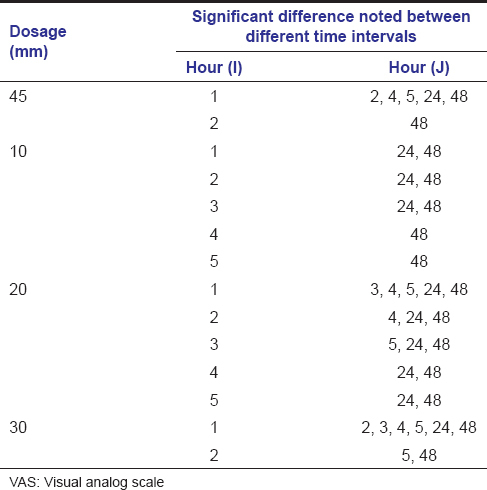 Subsequently, the comparison of the change in VAS between different time intervals in individual dosage group was done using Wilcoxon Signed Ranks test [Table 4]. A substantial reduction in the intensity of pain was noted in the Groups A and B. Both the Groups A and B were found to be having similar results at 1 st , 2 nd , 3 rd , 4 th , 5 th h after surgery, using Mann-Whitney test. Among the groups, Group A was most effective in the 1 st h after surgery, followed by Groups B, C, and D.
To date, oral analgesic delivery is the usual norm for postoperative pain control, but it is not without its own shortcomings. The need to undergo first pass metabolism, gastric irritation leading to bleeding and ulcers, various drug interactions, slower onset of action are some of the common disadvantages. To avoid these setbacks, it is vital that we start using other drug delivery systems. However, for a drug to be suitable in this route, certain norms have to be fulfilled. The appropriate NSAID and the polymer used for the transmucosal drug delivery should have optimum qualities such as low daily dosage and longer half-life. Considering all these criteria, the judicious selection of the constituents plays an important role in providing effective analgesia via this route. Meloxicam is an NSAID with potent analgesic, antipyretic and anti-inflammatory actions. It belongs to enolic acid (oxicam) derivative family and has bioavailability of 89%, half-life of 20 h and oral dosage of 7.5-15 mg/day. , Gastric irritation encountered with meloxicam was found to be minimal compared to other NSAIDs, due to its preferential cyclooxygenase-2 inhibitor actions;  however, still has to be used with caution in patients with history of ulcers and gastrointestinal bleeding. Its local tissue tolerability was found to be excellent, making it appropriate for parenteral, dermal, and mucosal administration. Thus, meloxicam has many favorable properties, making it the appropriate candidate for transmucosal drug delivery. Polymeric films provide an excellent meshwork for controlled release of the targeted drug. HPMC is a semisynthetic, inert, viscoelastic, hydrophilic polymer used in various drug delivery systems. It was selected for the fabrication of the films, because of its mucoadhesive property, due to the formation of gelatinous layer of hydrated polymer on contact with aqueous liquids. It works as a physical and diffusion barrier controlling release of drug and water ingression. Thus, this polymeric matrix serves as a perfect vehicle for transmucosal drug delivery. The dosage allocations of the films were done by considering the oral dose. The maximal oral dosage of meloxicam is 15 mg/day, which if considered for 3 days comes as 45 mg. Hence, this 45 mg dosage was taken as baseline dose and allotted to Group A. Then to assess whether the lower dose than the standard oral was effective and to ascertain the minimal effective dosage via transmucosal route, other three groups were selected. Subsequent to the film application on the surgical site, immediate pain relief was noted with the meloxicam transmucosal films. This implies rapid drug absorption from the buccal mucosa and availability of the drug systemically and its quick onset of action. The rapid response could be attributed to the instantaneous drug transport across rich vascular mucosal surface and inherent fast releasing property of the HPMC polymer. The reduction in postsurgical pain level was effective and comparable with the patient comfort level and was maintained throughout, in the both 45 mg and 30 mg meloxicam film groups. In the 20 mg group, the pain control was poor in the first 4 h, after which it showed significant improvement. But the 10 mg group showed the least effective pain control. The postoperative pain was found to be maximum in the first 24 h after surgery and gradually reduced thereafter. Thus, the postoperative pain management is most crucial in this critical period. The 45 mg and 30 mg showed predictable results in this regard, whereas both the 20 and 10 mg meloxicam groups didn't reach this ardent goal. The data signify that the standard meloxicam oral dosage of 45 mg is effective and also 30 mg is the minimum effective dosage required for meloxicam in the transmucosal drug delivery system for postoperative pain management. Furthermore, it is interesting to note that this route of analgesic delivery was so comfortable that many of the subjects in both 30 mg and 45 mg group preferred the same drug delivery system for the flap surgeries in other quadrants. Hence, the transmucosal analgesic delivery is a much more convenient and patient-friendly option compared to conventional oral analgesic delivery. But the practical use of it especially after periodontal surgical field is yet in its infantile steps. Thus, more research has to be carried out in this arena with other periodontal surgical fields and let the under-explored be understood completely. Transmucosal analgesic delivery using meloxicam films may be considered effective in postoperative pain management. Data from the current study signify that 30 mg of meloxicam films are effective in this regard. Hence, this mode of analgesic delivery is effective, efficient, safe, and comfortable in pain management after periodontal flap surgeries. Additional studies on the mucoadhesive analgesic films for other modalities of periodontal surgeries are necessary for further exploration and appraisal of this unique method. Curtis JW Jr, McLain JB, Hutchinson RA. The incidence and severity of complications and pain following periodontal surgery. J Periodontol 1985;56:597-601. Durand R, Tran SD, Mui B, Voyer R. Managing postoperative pain following periodontal surgery. J Can Dent Assoc 2013;79:d66. Garimella V, Cellini C. Postoperative pain control. Clin Colon Rectal Surg 2013;26:191-6. Crossley HL, Bergman SA, Wynn RL. Nonsteroidal anti-inflammatory agents in relieving dental pain: A review. J Am Dent Assoc 1983;106:61-4. Hersh EV, Moore PA. Adverse drug interactions in dentistry. Periodontol 2000 2008;46:109-42. Ong CK, Seymour RA. An evidence-based update of the use of analgesics in dentistry. Periodontol 2000 2008;46:143-64. Patel VF, Liu F, Brown MB. Advances in oral transmucosal drug delivery. J Control Release 2011;153:106-16. Rathbone MJ, Drummond BK, Tucker IG. The oral cavity as a site for systemic drug delivery. Adv Drug Deliv Rev 1994;13:1-22. Mizrahi B, Domb AJ. Mucoadhesive polymers for delivery of drugs to the oral cavity. Recent Pat Drug Deliv Formul 2008;2:108-19. Al-Hezaimi K, Al-Askar M, Selamhe Z, Fu JH, Alsarra IA, Wang HL. Evaluation of novel adhesive film containing ketorolac for post-surgery pain control: A safety and efficacy study. J Periodontol 2011;82:963-8. Stei P, Kruss B, Wiegleb J, Trach V. Local tissue tolerability of meloxicam, a new NSAID: Indications for parenteral, dermal and mucosal administration. Br J Rheumatol 1996;35 Suppl 1:44-50. Noble S, Balfour JA. Meloxicam. Drugs 1996;51:424-30. Moore RA, Derry S, McQuay HJ. Single dose oral meloxicam for acute postoperative pain in adults. Cochrane Database Syst Rev 2009;7:CD007552. Hawkey C, Kahan A, Steinbrück K, Alegre C, Baumelou E, Bégaud B, et al. Gastrointestinal tolerability of meloxicam compared to diclofenac in osteoarthritis patients. International MELISSA Study Group. Meloxicam Large-scale International Study Safety Assessment. Br J Rheumatol 1998;37:937-45. Cetin EO, Buduneli N, Atlihan E, Kirilmaz L. In vitro studies of a degradable device for controlled-release of meloxicam. J Clin Periodontol 2005;32:773-7. Colberg K, Hettich M, Sigmund R, Degner FL. The efficacy and tolerability of an 8-day administration of intravenous and oral meloxicam: A comparison with intramuscular and oral diclofenac in patients with acute lumbago. German Meloxicam Ampoule Study Group. Curr Med Res Opin 1996;13:363-77. Hanft G, Türck D, Scheuerer S, Sigmund R. Meloxicam oral suspension: A treatment alternative to solid meloxicam formulations. Inflamm Res 2001;50 Suppl 1:S35-7. Auvinet B, Ziller R, Appelboom T, Velicitat P. Comparison of the onset and intensity of action of intramuscular meloxicam and oral meloxicam in patients with acute sciatica. Clin Ther 1995;17:1078-98. Lees P, Cheng Z, Keefe TJ, Weich E, Bryd J, Cedergren R, et al. Bioequivalence in dogs of a meloxicam formulation administered as a transmucosal oral mist with an orally administered pioneer suspension product. J Vet Pharmacol Ther 2013;36:78-84. Nekoofar MH, Sadeghipanah M, Dehpour AR. Evaluation of meloxicam (A cox-2 inhibitor) for management of postoperative endodontic pain: A double-blind placebo-controlled study. J Endod 2003;29:634-7. Buduneli N, Vardar S, Atilla G, Sorsa T, Luoto H, Baylas H. Gingival crevicular fluid matrix metalloproteinase-8 levels following adjunctive use of meloxicam and initial phase of periodontal therapy. J Periodontol 2002;73:103-9. Toker H, Marakoglu I, Poyraz O. Effect of meloxicam on gingival crevicular fluid IL-1beta and IL1 receptor antagonist levels in subjects with chronic periodontitis, and its effects on clinical parameters. Clin Oral Investig 2006;10:305-10. Lodhi M, Dubey A, Narayan R, Prabhu P, Priya S. Formulation and evaluation of buccal film of Ivabradine hydrochloride for the treatment of stable angina pectoris. Int J Pharm Investig 2013;3:47-53. Powell CA, Mealey BL, Deas DE, McDonnell HT, Moritz AJ. Post-surgical infections: Prevalence associated with various periodontal surgical procedures. J Periodontol 2005;76:329-33. Türck D, Busch U, Heinzel G, Narjes H. Clinical pharmacokinetics of meloxicam. Arzneimittelforschung 1997;47:253-8. Schoenfeld P. Gastrointestinal safety profile of meloxicam: A meta-analysis and systematic review of randomized controlled trials. Am J Med 1999;107:48S-54S. Williams HD, Ward R, Hardy IJ, Melia CD. The extended release properties of HPMC matrices in the presence of dietary sugars. J Control Release 2009;138:251-9. Seymour RA. Efficacy of paracetamol in reducing post-operative pain after periodontal surgery. J Clin Periodontol 1983;10:311-6.